Today Queen Letizia started her official week after the state visit to United States by joining the celebration of International Deaf and Blind Day in the Alicante town of Benidorm. 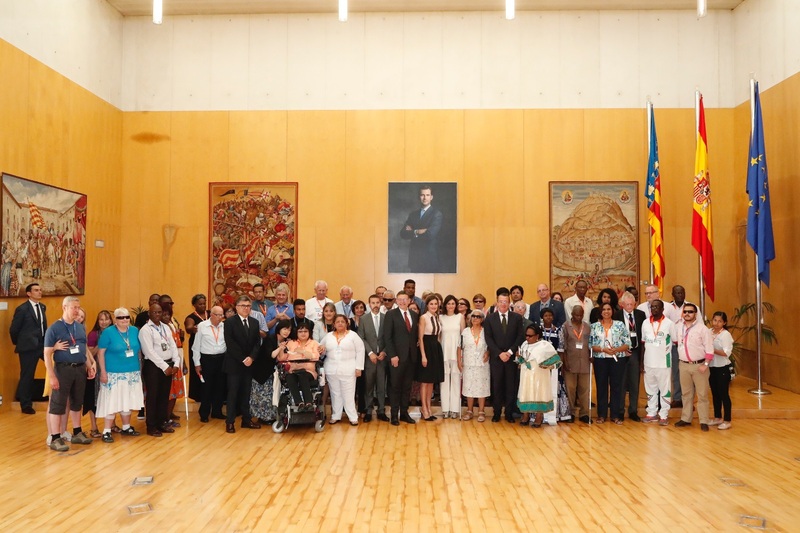 The event was organized by the Federation of Deaf-blind Associations of Spain. The event is held internationally to commemorate the achievements of Helen Keller on her birthday, the first Deaf-blind person to demonstrate the capacity of Deaf-blind people, overcoming the barriers that this group encounters, graduating from the University, and authoring various essays. She was a political activist and American speaker and lecturer. In Spain, the International Deaf-blind Day was celebrated for the first time in 2009 in Alicante, and since then it has been held every year. The Board of Directors of FASOCIDE presented their annual manifesto for the association. Letizia held a meeting with the Board of Directors of the World Federation of Deaf-blind people and later had the opportunity to talk with the international delegates of Deaf-blind associations. Letizia with members of the association. Today Queen brought back the old elements from her wardrobe to make a new look. She was wearing shell pink sleeveless top debuted in 2016. She recently wore the top during her cooperation visit Haiti. 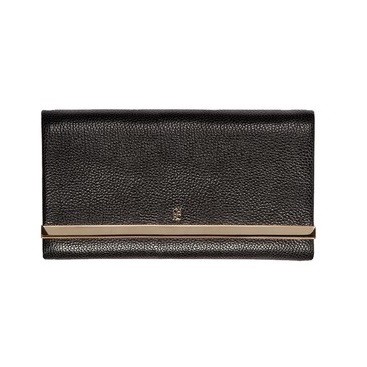 The top features contrasting panel of black ribbon with a mix of solid and sheer. Letizia teamed up the top with black high-waist full circle skirt that she debuted in 2015 at Telefónica Ability Awards. The label of the skirt is still unknown. 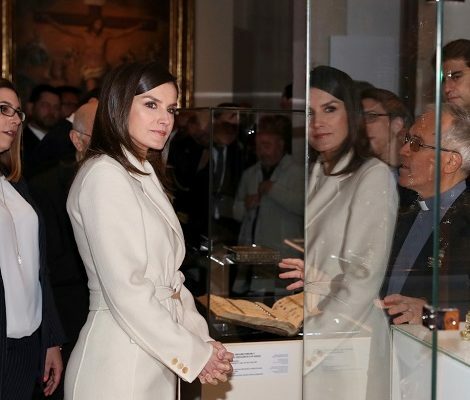 Queen Letizia was carrying her Carolina Herrera Astrud Clutch and chose black pointy-toe suede sandals with transparent strip. Letizia debut the sandals during her State visit to United States earlier this month and they are believed to be from Steve Madden’s Plaza model. Her Coolook earrings containing fumé quartz on top with rose quartz and rutilated quartz at the bottom part finished today’s look. That top has been part of her wardrobe for so long time. Its good to see her wearing again..